Boats would enter the tunnel from the Bridgewater Canal through the Grocers’ Warehouse, which is partly reconstructed on Castle Street. A hoist powered by the River Medlock allowed coal to be lifted to the level of Castle Street such that it didn’t have to be taken up the hill from canal level. Excavations in 2007 discovered a vertical shaft (marked on the map) from this tunnel between Liverpool Road and Bridgewater Street. Underground Manchester (Warrender, 2007:60) suggests this was used to haul coal into a warehouse. Part 3 of Adshead’s 1850 illustrated map of St John’s Ward shown here shows the tunnel finishing at the Grocers’ Company’s yard and stables on Bridgewater Street. You can see photos from Ojay on Northwest Exploration of the first part of the tunnel, entering from the reconstructed warehouse in Castlefield basin. There is an excellent investigation into the history of the tunnel and the associated warehouse, with photos from inside, maps and drawings in The Grocers’ Warehouse, Castlefield: the First True Canal Warehouse? by Michael Nevell from the University of Salford’s Archeology department. From the wharf at this place the poor of Manchester fetch great quantities of coal in wheelbarrows and Mr Brindley in order to remove the inconvenience of carrying them up Castle hill is driving a large tunnel through the center of this hill into which he intends to introduce his barges and by a crane which is to be worked by a box water wheel he proposes to land the coals close to this town. … There is a large tunnel in Castlefield, under the hill in which will be a bucket wheel, 30 feet circumference, and four feet four inches wide, to draw up the coals brought in boxes fixed in the boats, and contain about eight-hundred each; and when discharged, will be landed where the way to Manchester is so level, that a good horse may easily draw one ton to any part of that town. You can see the tunnel on this Manchester Archives photo from 1984 and in this CanalScape photo. Originally a coal yard, Pioneer Quay was named in 1987 and you can see from this 1984 photo that the area has been smartened up considerably since then. Another description of the tunnel (and more photos) can be found on the Castlefield Canal Heritage Walk, but I have not been able to confirm that this tunnel indeed headed towards Bank Top; I believe this account is confusing this tunnel with the Duke’s tunnel. Beyond the loading docks inside the warehouse was the entrance to a tunnel known as the Bridgewater Tunnel. This tunnel ran for 620 yards (600 mtrs) from the warehouse entrance through the solid sandstone escarpment as far as Bank Top with shaft connections to coal yards along its length. 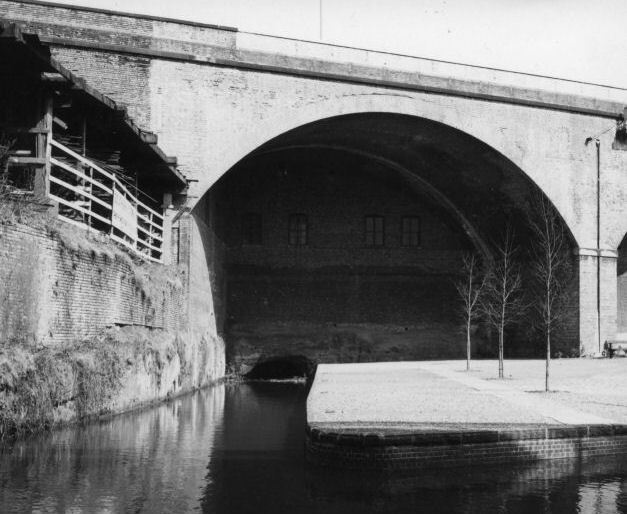 The tunnel was truncated and sealed-up when the Rochdale Canal was constructed in 1800. In 2007 parts of it came to light when land between Bridgewater Street and Liverpool Road was being redeveloped.